CASiLaC (Centre for Advanced Studies in Languages and Cultures) invites you to the another of our ECR research seminars in the 2016-17 series. The aim of the series is to showcase the research activities of early career researchers within the School of Languages, Literatures and Cultures. The ideas of third meaning, third space and third culture are prevalent in many disciplines, from semiotics to education, literary criticism to intercultural communication. These concepts, particularly regarding the creation of meaning between individuals and across cultures, have also influenced researchers in the area of language teaching and learning. On the basis of my empirical research and drawing on the work of Claire Kramsch (2009, 2006, 1997, 1993), in this paper I discuss aspects of thirdness in language education. I examine third culture as a means of questioning traditional dichotomies in language education particularly the distinctions between native and non-native speaker, and L1 and L2. I then investigate sociolinguistic and socio-cultural aspects of classroom discourse in relation to the concept of third space. This leads me to explore the purpose of formal language education and to confront some practices that may be taken for granted in language teaching and learning. 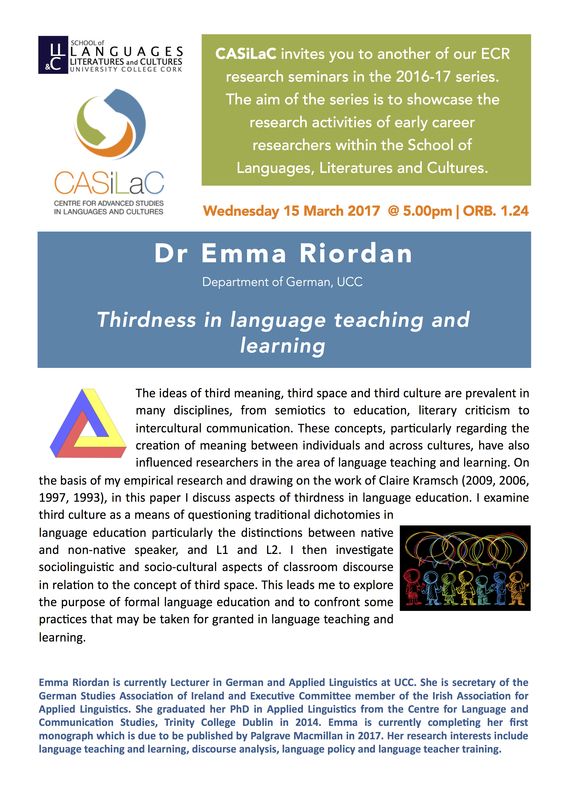 Emma Riordan is currently Lecturer in German and Applied Linguistics at UCC. She is secretary of the German Studies Association of Ireland and Executive Committee member of the Irish Association for Applied Linguistics. She graduated her PhD in Applied Linguistics from the Centre for Language and Communication Studies, Trinity College Dublin in 2014. Emma is currently completing her first monograph which is due to be published by Palgrave Macmillan in 2017. Her research interests include language teaching and learning, discourse analysis, language policy and language teacher training, discourse, target language use, language education policy, teacher education and Language for Specific Purposes. She is executive committee member of the Irish Association for Applied Linguistics.